Baby’s not a baby any more! It’s a strange feeling. Two years ago I was childless and happy, and today I have a toddler and am even happier. This coming Wednesday my daughter and I both have birthdays. She’ll be two, and I’ll be 29 again. We celebrated her birthday yesterday with my husband’s family and had a lovely day eating rainbow cake. I felt a bit guilty letting her eat so much food colouring, but honestly, it’s once a year. I’m not feeding her red icy poles on a daily basis, and there’s no red cordial in our house! Last year we went a bit overboard with a Very Hungry Caterpillar birthday theme, and this year we toned it down a lot, and had rainbow things. My daughter loves rainbows – I’m always drawing them for her and she loves to give it a go herself. 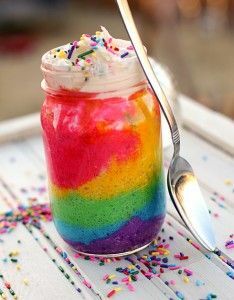 So off to Pinterest I went and found the most amazing rainbow cakes in jars that I just had to make. Rainbow cake – what a success! It took a bit more effort than I thought, and if I could I’d do them again because I got my amounts wrong, so instead of one rainbow, I had to mix up two batches and had two rainbows in the end. They also shrunk a bit while cooling, but I don’t know how I could have prevented that to be honest – any ideas? And here’s my daughter, enjoying herself immensely! As a little bit of fun for myself, I dressed her as my two year old self for the day. My mum has a photo of me with my hair in pigtails and wearing this exact dress as a two year old, so because my own family can’t be here to celebrate either birthday, I wanted to offer a bit of a tribute to them too. The best part of the whole day was Raina saying happy birthday all the time and even singing Happy Birthday to You, she’s awesome.